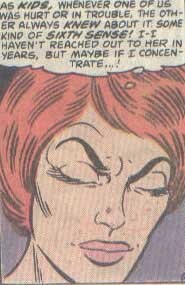 Powers/Abilities: Ann Stanford did not display any superhuman powers, although she was able to sense her twin sister's feelings and cause her feelings to be sensed as well. This did not appear to be a superhuman power, as twins are often able to sense how the other is feeling at times. 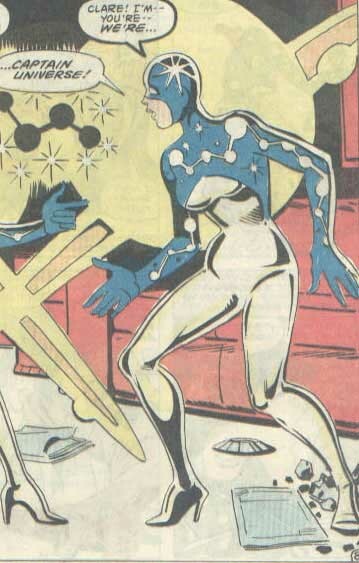 As Captain Universe, Ann could manipulate cosmic energy for a variety of effects, including creating objects of energy, flight, causing an enemy to paralyze with a touch, generating miniature whirlwinds with her breath, manipulating magnetic fields, projecting light via Univision, and heightening her sense of empathy with her sister to superhuman levels. She presumably also had the superhuman strength and durability that also came with the Uni-Power, although she did not display them. History: (Marvel Spotlight II#10) - After her sister Clare appeared in a trial to help convict a group of criminals, Ann Stanford and her children were visited by the same criminals, who were working for a local crime lord called Nemesis. The criminals held Ann and her children hostage in her own home at gunpoint until Ann's sister, Clare, arrived for dinner and sensed something was wrong. Clare soon jumped through the window and attempted to stop the thugs holding Ann hostage. Clare ordered Ann to get the kids out of there and Ann quickly motioned her children into the kitchen. Once her children were safe next door, Ann ran back out into the living room of her house to help her sister, where she spotted another criminal outside about to shoot Clare. As Ann searched for something to throw at the crooks, she and Clare were surrounded by a field of energy that transformed both Ann and Clare into twin Captain Universes. Instinctively grabbing a can of aerosol spray, Ann caused it to emit a stream of energy particles that surrounded the gunman outside in an energy cocoon. After realizing that they had gained superpowers, Ann and Clare decided that they must use their power to save Ann's husband, Edward, from the crooks as well, since he also helped convict the criminals. Once she realized her husband was in danger, Ann became determined to save him, contradicting her normal personality of a meek housewife. The twins soon learned that the crooked wrestling manager Mike Rooney was connected to Nemesis and decided to visit his gym to ask a few questions. When Clare asked about Nemesis, Mr. Rooney sent some goons after them, which Clare and Ann easily "mopped" up. After defeating Rooney's goon, the duo discovered that Nemesis was basing himself out of the Phoenix Drive-In Movie Theater, which they immediately left toward. Ann and Clare soon found Nemesis hiding out in his lair and busted in to stop him. After stopping a few of Nemesis's men, Ann followed Nemesis as he tried to make his escape. Unfortunately, Ann flew right into a trap room that began to fill with water. Calling out to Clare, Ann was saved by her sister's timely arrival and the duo gave chase to the escaping Nemesis, thinking him to have Edward with him. Nemesis attempted to run over the women with his car but veered off course at the last second and crashed. Clare grabbed Nemesis and unmasked him, revealing to Nemesis to be Edward Stanford himself. Shocked, Ann asked Edward to explain himself. Edward explained that he acted as Nemesis to get more money to support the family, but Ann punched him to the ground, angry that Edward was prepared to kill his own sister-in-law to meet his ends. Once Edward was arrested, Ann and Clare returned to the Stanford home, where the Uni-Power left them. The now non-superpowered Ann then explained to her children that they were on the own and they had to be strong without their father. Jenny & Johnny Stanford were the children of Edward and Ann Stanford. They were held hostage along with Ann by the Nemesis's goons until Clare arrived and defeated the crooks. 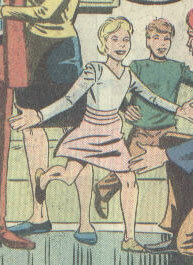 Ann quickly told the children to run next door and they did so, where they stayed until Ann returned from a night as Captain Universe to them that their father had left.